Aziz Ansari just proved to us that sometimes dreams really do come true, like the dream of eating at Tyrese&apos;s Benihana-style restaurant in his backyard dubbed "GibsiHana&apos;." Yes, actor Tyrese Gibson really does have a private teppanyaki restaurant built in his backyard in the Valley. It even has its own dedicated Facebook page, and a tranquil Japanese-style building complete with a menu and a chef. And on Monday night, Aziz Ansari celebrated his brother Aniz Ansari&apos;s birthday along with the guys from The Lonely Island at Tyrese&apos;s GibsiHana&apos;. It looked like the best birthday party ever to say the least. Here&apos;s the crew singing along to Ace Hood’s "Bugatti." Tyrese Instagrammed the same video accompanied by the caption, "My backyard looks like a them park ride!!!!! #GibsiHana too epic...... A night to remember....... "
Ok @Tyrese, so @TheLonelyIsland and I are dying to eat at GIBSIHANA&apos;S. Can we make this happen after you finish the #TGT tour? It was also in emails with [Andy] Samberg and his cohorts in the comedy collective, The Lonely Island, that Aniz&apos;s sharp sense of humor found a worthy source of inspiration. He&apos;d begun an epic email chain about actor/singer/philanthropist Tyrese Gibson, who goes by the inexplicable Twitter handle, VisionImplementer. Aniz wrote long, detailed analyses of what Gibson chose to do with his money—building a giant replica of a Benihana in his backyard, for instance, which he actually dubbed Gibsihana. Samberg and The Lonely Island crew couldn&apos;t get enough. 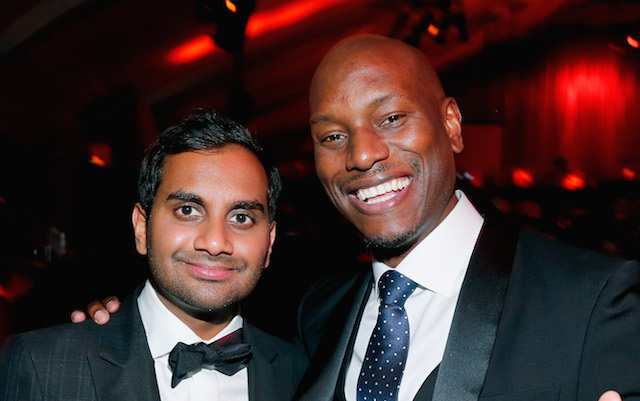 "Andy was one of the guys who told Aziz and also told me that I should just start writing because I&apos;m wasting my time doing all these Tyrese emails and I should probably do something a little more constructive with it," Aniz says. "But I am not opposed to still writing about Tyrese, and if Tyrese ends up reading this—if he wants to reach out to me to write stuff for him—I&apos;d love to connect and go to his home in the Valley and eat at his Benihana." And then in 2014, Tyrese posted a YouTube video giving a tour of GibsiHana&apos;, showing his restaurant with the letters "GH&apos;" embedded into the concrete. "I&apos;m going to roll this out to a real franchise," he says in the clip. "That&apos;s my goal this year." There&apos;s a glimmer of hope for all of us to get a reservation some day.